Summary results from the consultation are available now - you can download the results below. We will prepare responses to the consultation feedback and create a recommendations report that incorporates the consultation feedback. We will consider the feedback as we develop our proposals going forward. We would like your views on upgrading a path in Stoke Park, to make it easier for more people to make use of the park and to support new housing in the area. Our proposal is to upgrade an existing path connecting Lockleaze with Jellicoe Avenue at the eastern edge of the park, to create a new all-weather accessible path for both walkers (including families with push-chairs, older people, and those with mobility difficulties) and cyclists. At the moment, it's difficult for people with mobility difficulties or pushchairs to enjoy the park because the paths get muddy and the surface can be uneven. The route options drawing can be seen here. We have also chosen this route because the Stoke Park Conservation Management Plan identifies upgrading the historic carriage drive as a priority. The work we're doing tries to make the path as accessible as possible while also combining well with the Conservation Management Plan. As part of improving access for those with mobility difficulties and limiting illegal motorcycle entry to the park, we are also interested in your views on whether we should improve the access barriers around Stoke Park. We'd also like to hear your suggestions for other features, such as seating and information boards. We're undertaking archaeological, bat, ecology and tree surveys in advance of any works commencing. We want to make sure that the type of path that we're proposing is the right path for Stoke Park. We have created a suggested route, but we haven't created any detailed designs because we don't want to make decisions before hearing from users of the park and local residents. 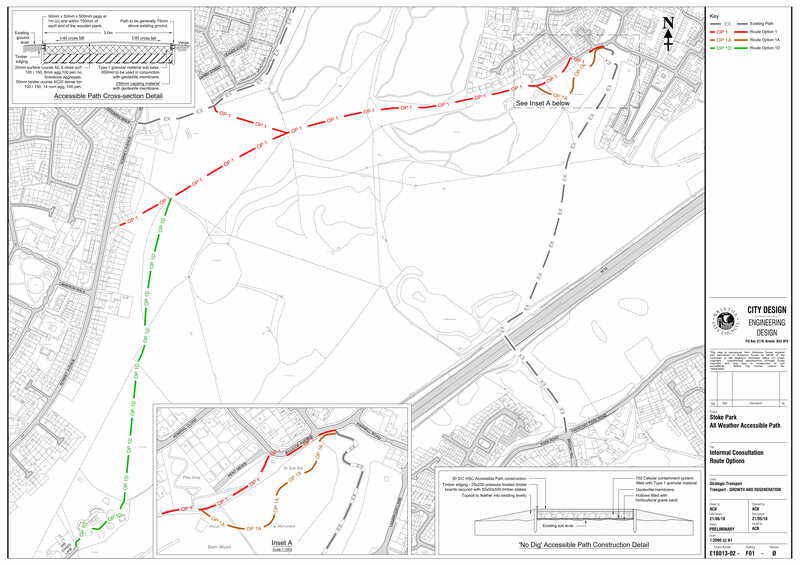 The consultation questions will ask your opinion on whether the path should be upgraded, as well as your opinion on all of the different parts of the design of the path. Why have we selected a route already? Is the path fairly flat so that everyone can easily use it? Does it connect with other parts of Bristol that people want to go to? Does it start at the places where people want to access the park? Is it sensitive to the historic context of the park? How can the path minimise effect on ecology, trees, or protected species? All these considerations mean we have to come up with an idea first, so that we aren't asking your opinion on something that isn't possible. We'd like to describe other options we've considered and rejected. We considered a more direct route connecting Lockleaze to the M32 underpass, cutting down either through or around the Pale Plantation. However, the hill would mean the path would need several switchbacks to avoid being too steep - we'd need to cut down trees and the path would have a big visual effect, and would be difficult to use for people using wheelchairs. A blacktop path would be a cheaper surfacing option, similar to other paths in Bristol. However, it would be completely inappropriate in Stoke Park, especially as it would conflict with the surface of the existing all-weather path. We will be publishing an interim summary report of all the consultation responses as soon as possible after the close of the consultation. We will publicise this report as widely as possible, but we don't have contact details for individual respondents so we can't let you know directly. There will be a later, final report that will form part of the planning application if the proposal progresses to that stage. The consultation will inform the proposal, and give us a lot of information not only about the all-weather accessible path proposal but also about why respondents value Stoke Park and how they feel it should be safeguarded and respected. We'll be holding a drop-in session at the Old Library on Muller Road between 12pm and 3pm on the 5th of October. We will be holding a public meeting at The Cameron Centre at Gainsborough Square in Lockleaze - on the 9th of October between 6pm and 8pm. Please come along to discuss the proposals and ask any questions you may have. We're holding an additional drop-in session in the last week of the consultation at Buzz Lockleaze on Gainsborough Square! It'll be between 2pm and 5pm on Tuesday the 30th. We're holding an additional drop-in session in the last week of the consultation at Park One Coffee in Stapleton! It'll be between 12pm and 3pm on Wednesday the 31st of October.